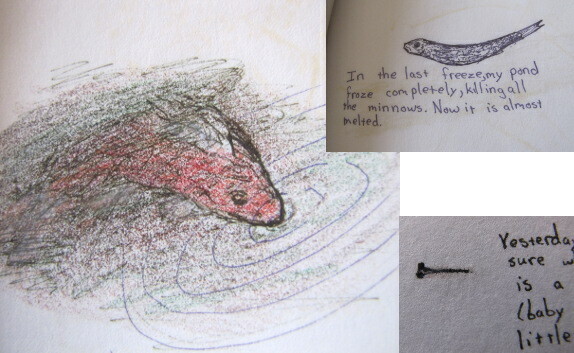 Until I sat down on Friday afternoon to watch my three tiny goldfish soar through their watery environment, I'd forgotten how much joy I used to get from the three little ponds I built in my city backyard as a high-school kid. 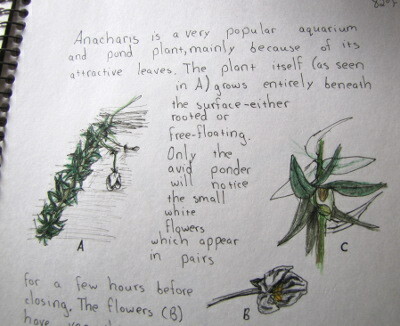 Yes, while normal people were out doing whatever teenagers do, I was building a resilient pond ecosystem (a success), trying to get moss to grow on concrete (a failure), and making daily sketches of whatever caught my eye. 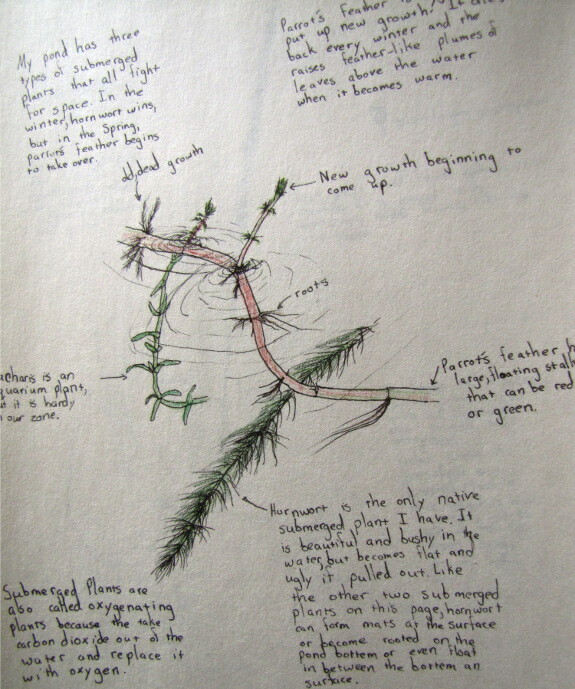 I flipped back through the sketchbooks this weekend to refresh my memory about what exactly was in that pond ecosystem. The fish, of course, got top billing. I tried to add minnows out of a nearby creek, but most died immediately due to low dissolved oxygen levels in the unmoving water, and the last ones froze over the winter. Koi were beautiful, but really too big for my "mud puddles" (as annoyed siblings were known to call them), and not winter hardy. On the other hand, I'm pretty sure my feeder goldfish froze solid one winter and came back to life that spring. They even got big enough to fill the ponds with tiny goldfish fry! Of course, there were more photogenic plants too. I played with just about everything from lilies to flags to forget-me-nots, and most of them slowly petered out when the pond froze through. 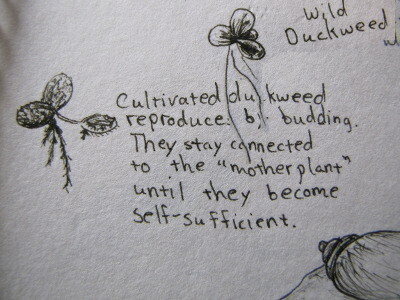 Having some emergent plants was handy, though, because it seemed to attract insect life --- damselflies, dragonflies, and water striders all showed up and bred. Frogs arrived too, one of whom actually sat on a lily pad, to my extreme surprise --- I thought that behavior was only a characteristic of cartoon animals. 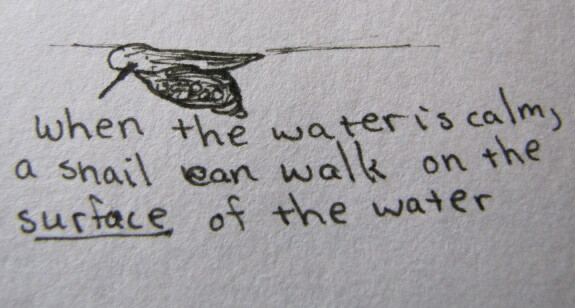 I even learned to identify song sparrows when they came to bathe at the pond on warm afternoons. If I had built my guilds perfectly, you'd think the pond would still contain just as much diversity 16.5 years after I graduated and left the aquatic ecosystem to its own devices. Instead, everything seems to have disappeared except the duckweed (and possibly the tadpole snails). 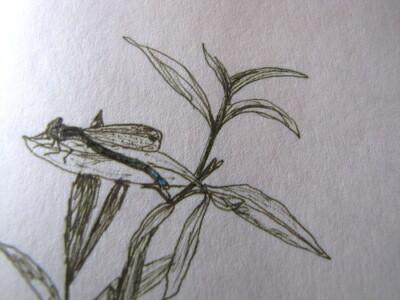 I mostly blame the decline in biodiversity on the small scale --- it's tough to keep a fifteen-gallon world in balance. 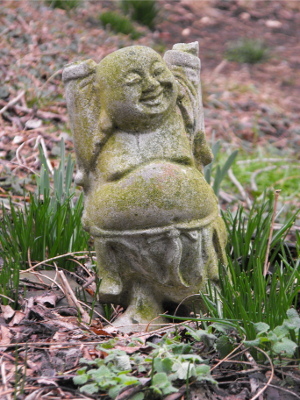 On the bright side, I do seem to have finally managed to grow moss on my laughing Buddha. Too bad he needs to stand guard over the first generation and can't move to my new digs. Maybe I'll find a new mascot for my twenty-first century pondlet? 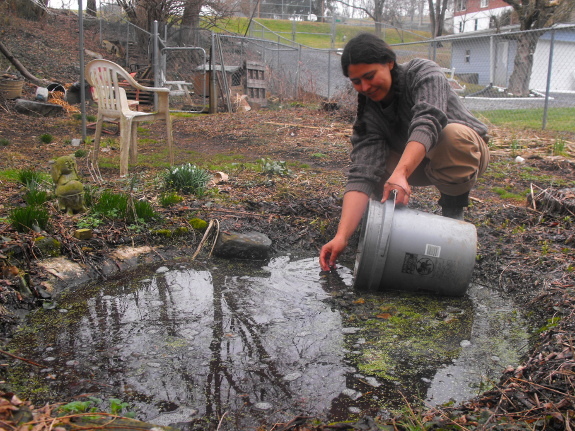 Our chicken waterer keeps the flock's drinking water clean so I can focus on growing wild foods. This reminds me of my pond, but I used to call it a water garden. I kept feeder goldfish in it and captured a Southern Leopard Frog from my grandad's pond to transplant to mine. Those two species kept going for several years. I also added snails, water lillies and elodea, but in the middle of summer the only plants that could clear up the water were water hyacinths. They had to be replaced every year. I can't remember where I got them. Eventually the mimosa I planted next to the pond grew so big that the roots broke the plastic liner (which looks like your graywater liner), and that was the end of it. Now there's just a huge mimosa and a few of the plants remaining. What impressed me the most was that your pond kept fresh water clams alive. As I remember, you got some from the Clear Creek wetlands area. I was sort of concerned about your new goldfish--because they might freeze, and not be hardy enough to withstand it? It's so wonderful that you kept a little journal on your experiments! I've kept similar little documents on my own tinkerings, but they sadly became lost or thrown out over the years. I can't wait to see what you make of the mini-pond! Hi Anna, you were quite the artist then too! Just wondering, does the grey water flow into or through the pond and if so, do you use a special type of dish soap or are the fish not bothered by it? Sorry if I missed this info somewhere in your blog. Heather --- The pond is at the far end of the greywater wetland. It shouldn't see any water flowing into it until we've got our gutters hooked into the greywater system, and then only during extremely heavy rains. (Or perhaps not at all --- it's hard to say how much water the wetland will soak up.) So I'm not too concerned about dish soap, but our next deluge will tell for sure. 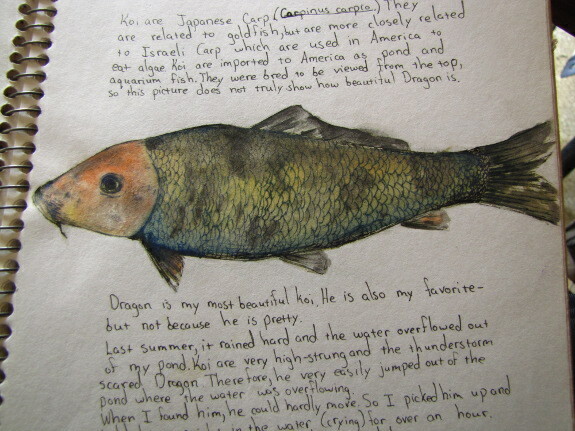 I just love the drawings, looks like you used colored pencils? I have a little pond and I'm always amazed at what the goldfish will survive (bullfrogs too.) In the summer when the pond is almost dry, they seem to bury themselves into the mud. And I'm not sure if it ever froze solid, but they came through about every winter (zone 7 though.) Only thing that got them I think were the snapping turtles, herons, hawks, and the neighbor's cat.